Easter is coming and that means Easter Bonnets and Decorated Egg competitions are looming. 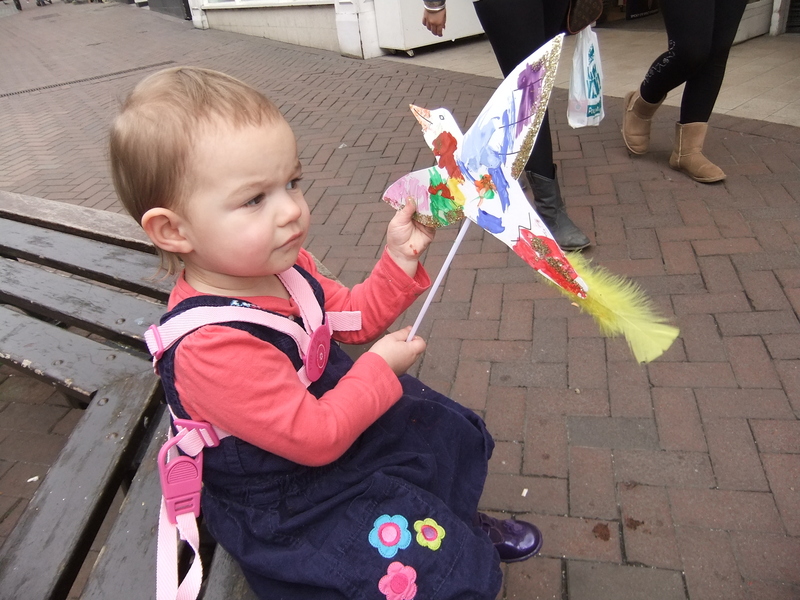 Last year my Mum and I slaved over a masterpiece bonnet for Tori and she trashed it during the parade (she hates hats) – she got a little egg anyway. That she couldn’t eat. This year we came up with an idea for a bonnet that Tori could help to make and I sat down with her yesterday to make it with this beautiful image in my head of the finished result. Expertly coloured, neatly crafted, giant-Easter-egg-winning perfection. 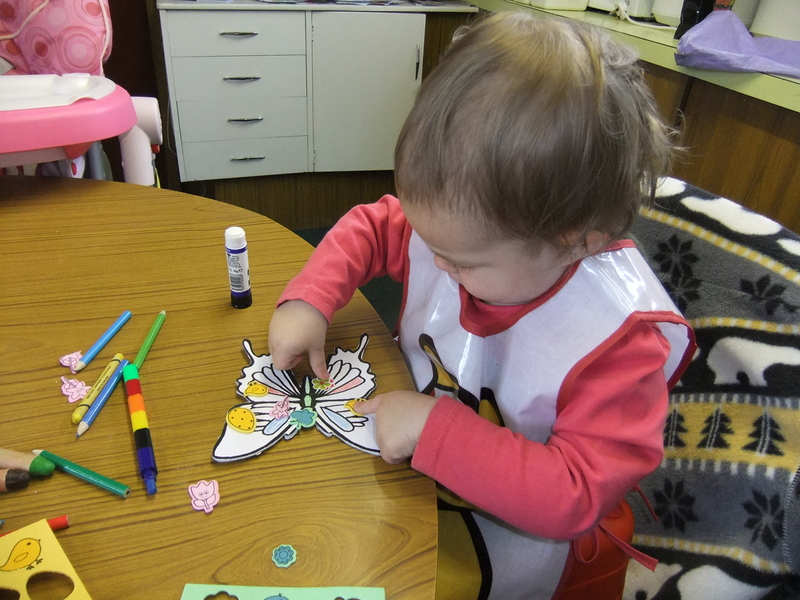 I got out the crayons and handed Tori the butterfly that I had carefully cut out and stuck onto card. Then nearly grabbed it straight back off her as she scribbled on it willy-nilly (she’s not even two yet – what on Earth was I expecting her to do?). I did actually reach over to remove the crayon from her grasp when Tori turned to look at me and beamed gleefully – suddenly I felt like a right fool and stopped trying to take they crayon away. I’d missed the point entirely. This wasn’t about winning eggs or making the most ‘perfect’ bonnet – it was about spending some quality time with my girl and having some fun. 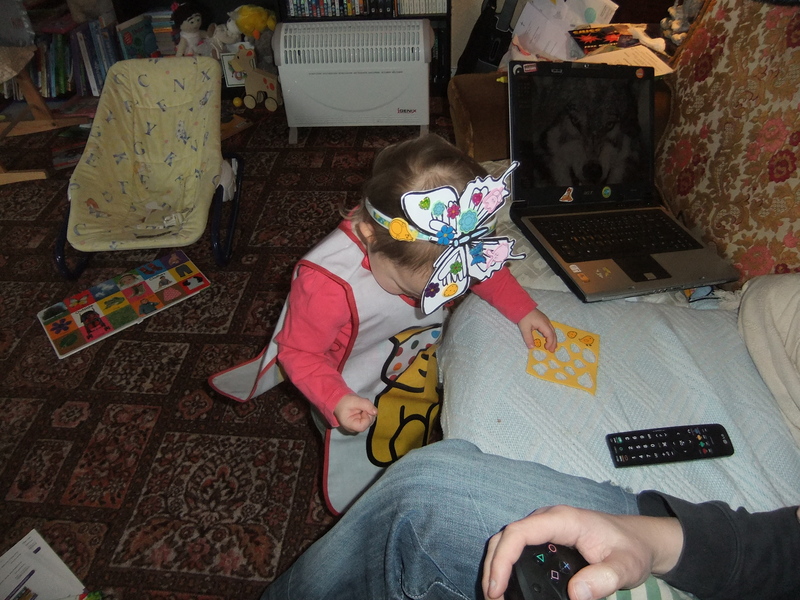 It was about watching her learn as she experimented with stickers, crayons, pritt-stick and foam shapes. It was about fun and togetherness. And you know what? When she’d finished – it was perfect. It was the best butterfly in the world. Ever. And it’s the best bonnet ever too because she made it by herself just how she wanted it. Five minutes later I walked back again thinking ‘So what?’ It was all washable paint and it looked like great fun. The joy we had painting and playing together far outweighed the niggle I had about a bit of paint on her dress. These last two days have been an education for me – I have realised what is important and what isn’t. My daughter is important. Spending time with her is important. Worrying about a tiny bit of paint or winning a competition is not. Also, the last two days have been about making sure that my little girl knows that she is still the centre of my universe even though life has changed since ‘Baby’ arrived. it’s like a fascinator – love it!! !